Titanium – High speed steel bits which have been coated with titanium nitride. This special coating gives the bits a very high surface hardness to help penetrate tough materials, makes the bits highly corrosion resistant and significantly reduces friction between bit and workpiece. Titanium coated bits last up to 6X longer than standard high speed steel bits. Vermont American titanium drill bits feature the following: (1) grip tight shank for positive chuck hold, (2) titanium coating hardens bit surface or improved durability in tough, repetitive applications and acts as lubricant, requiring less torque and less heat build-up for longer bit life, (3) speed helix augers dust away from tip more quickly, reducing heat for long life and (4) 135 degree split point starts fast and reduces drill walking. Click here to see available sizes. Cobalt – Cobalt bits are a special formulation of high speed steel with cobalt added in to withstand very high drilling temperatures. Cobalt bits are specifically designed for drilling very hard, abrasive materials such as treated stainless steel, titanium and cast iron. Cobalt bits are not designed for general purpose use. Vermont American cobalt drill bits feature the following: (1) grip tight shank for positive chuck hold, (2) cobalt withstands high drilling heat for longer bit life and includes thick web for increased durability and (3) 135 degree split point starts fast and reduces drill walking. Click here to see available sizes. Black Oxide – High speed steel bits with an added heat treatment that reduces friction between bit and workpiece. Black oxide bits have 50% longer life than standard high speed steel bits. Click here to see available sizes. Gold Oxide – Offers added speed and durability for general purpose drilling applications in wood, metal and plastic and drills 3x faster with speed helix. Click here to see available sizes. 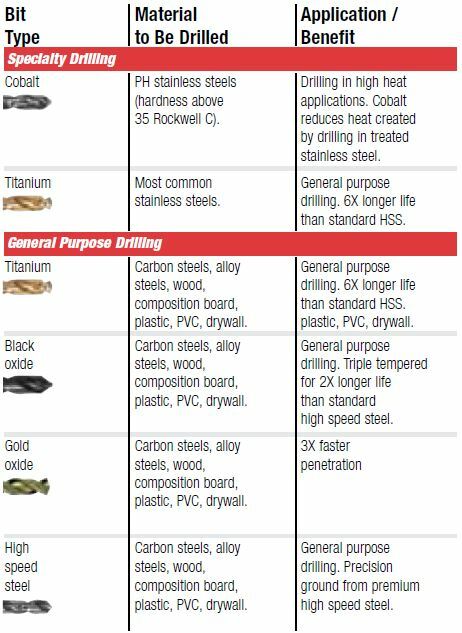 High Speed Steel (HSS) – Standard general purpose bits with a polished finish with silver appearance. Click here to see available sizes. 118° Point – Designed primarily for drilling into wood or plastic. Center punch is required for drilling into metal, otherwise bit will “walk” or “skate”. 135° Split Point – Starts on contact in metal, wood and plastic. Eliminates “walking” or “skating” when drilling into metal. 135° Split Point on all bits above 1/8″. Speed Helix – More aggressive drilling angle on drill bit flutes, which provides up to 3x faster penetration. Extends the life of the drill and extends battery life in cordless drills.